﻿ Segment Disc Manufacturing Process | Technical Information | F.C.C. Co.,Ltd. To manufacture friction discs, F.C.C. 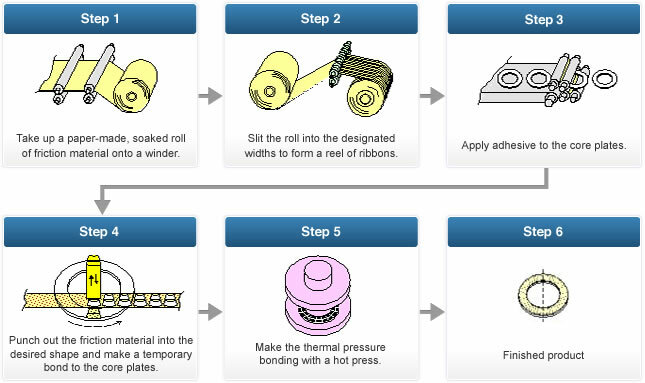 developed its original manufacturing method called the “segment system.” Due to the large improvements in clutch production efficiency and clutch quality, this production system has made great strides in both process efficiency and material yield through pressure bonding of core plates with friction materials in tape form. In addition, the patterns of the oil grooves, whose high degree of flexibility is produced by the special features of the manufacturing process, assure that the production system can adapt to a diverse set of product requirements. The most noteworthy feature of our segment discs is the marked improvement in material yield they have created, allowing us to lower costs substantially. The amount of scrap has also been reduced, making our manufacturing environmentally responsible. Through our segment disc manufacturing process, we can form segment discs in a variety of shapes and respond flexibly to a broad spectrum of product performance requirements. A clutch must satisfy a diverse set of performance requirements, such as reducing gear shift shock associated with speed changes by enhancing friction performance (for improved riding comfort) and raising fuel economy by lowering drag when the clutch is disengaged. Segment discs fulfill these requirements by developing highly adaptable, oil groove patterns.